Before we put our line of dietary supplements on our store shelves, we looked for a supplier that would meet our high standards. After meeting with many manufacturers, we found a company with our values that we could trust with 90 years of manufacturing experience, resulting in consistent and safe products. Our supplement manufacturer has been owned and operated by the same family since 1925 and runs a facility that is certified organic by Quality Assurance International (QAI) and third party certified by the Natural Products Association. • They followed cGMPs (current Good Manufacturing Practices) even before the FDA mandated that regulation for dietary supplement manufacturers. • Raw materials and end products undergo various tests to ensure potency, purity, and disintegration. They use state-of-the-art technology to carefully screen each rawmaterial for quality and uniformity. They routinely inspect their materials and supplements for identity and potency. • All their manufacturing procedures and standards for cleanliness are periodically audited by the FDA and meet FDA requirements. • A complete testing laboratory is used to test for dangerous bacteria like Salmonella and E. coli, but also for gluten, melamine, and pesticides in botanicals. They also test for the potency of all nutritional ingredients before they can be used in products. • They have a state of the art ICP-MS (Inductively Coupled Plasma-Mass Spectrophotometer) to test for heavy metals. • From their testing, we always provide a Best By date on the bottom of each bottle, thus guaranteeing the potency, purity, and freshness of our products! We only offer dietary supplements with science behind the formulations. Our manufacturer has a team of scientific professionals (including chemists, microbiologists, and a registered dietitian-nutritionist) plus product development specialists to ensure scientifically sound formulas. Our manufacturer is dedicated to supporting green initiatives; they ship our supplements in boxes that use partially-recycled materials and recyclable crushed paper as packing material. The fully recyclable amber glass bottles are made from 35% recycled material, and the white plastic caps are also fully recyclable. Their promotional materials utilize post-consumer fibers. Their manufacturing facility makes use of natural skylights to save energy and provide a pleasant work environment, and they recycle all unusable computer hardware and equipment. Each year since 2006, our manufacturer participates in donating 11 million children’s multivitamins to the Vitamin Angels non-profit organization. Established in 1994, Vitamin Angels is the only non-profit organization in existence solely dedicated to providing vital nutrition to women and children in need internationally and domestically. Through its “Operation 20/20” campaign, they plan to eradicate childhood blindness caused by vitamin A deficiency worldwide by the year 2020. Over 30% of the world’s population suffers from micronutrient deficiencies. Both Vitamin Angels and our manufacturer believe every person has a right to basic nutrition. Who wants to pay for the marketing and advertising costs of national brands? Our products do not include those extra costs. 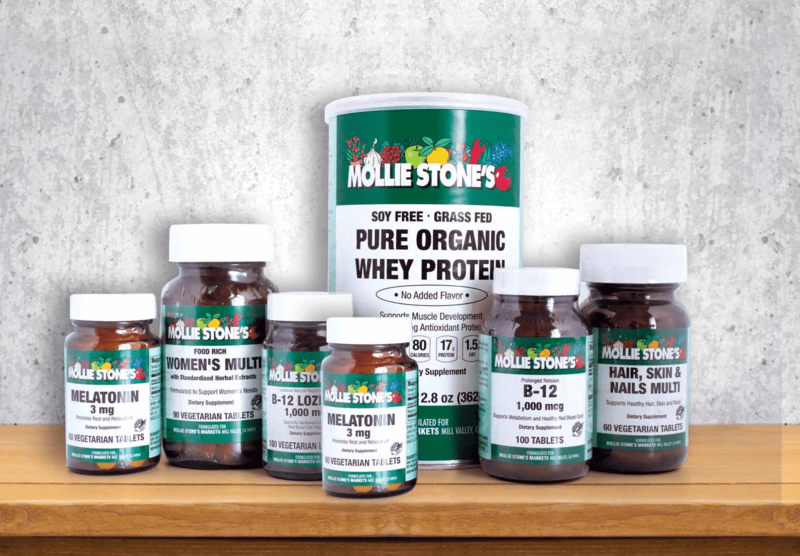 We hope you’ll choose Mollie Stone’s Market dietary supplements. When searching for natural, premium dietary supplements to promote overall wellness look no further than your local Mollie Stone’s Market.